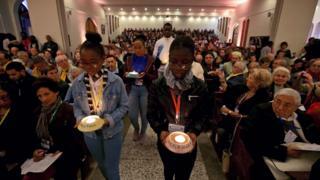 The Catholic Church has beatified 19 Catholics killed in Algeria’s civil war – the first such ceremony in a Muslim nation. Most of them were French – seven were Trappist monks, and one a bishop. In a message, Pope Francis said he hoped it would “heal the wounds of the past and create a new dynamic of meeting and living together”. Algeria’s 1991-2002 war between Islamists and the government killed up to 200,000 people. The monks’ story was later the subject of the French film Of Gods and Men, which won the Grand Prix at Cannes in 2010. They included the French-born bishop of Oran, Pierre Claverie, who was killed along with his Muslim driver Mohamed Bouchikhi – who had chosen to stay with the bishop despite the risk to his life – when a bomb exploded at his home. May “Monsignor Pierre Claverie… and his 18 companions, faithful messengers of the Gospel, humble artisans of peace… from now on be called blessed,” said papal envoy Cardinal Angelo Becciu. “May this beatification be an incentive for all to build a world of fraternity and solidarity together”, he said. Opening the ceremony, Archbishop Paul Desfarges of Algiers paid tribute to the victims of the civil war and a minute’s silence was held.